International manufactures the industry standard self-closing, fire-rated fireproof lot-line window. Our lot-line windows are all made to order. They are rated by the New York City Board of Standards and Appeals for 3/4-hour which is the maximum fireproof rating for a window. In almost all cases, lot-line windows are glazed in the factory with either 1/4" clear or frosted wire glass. (For certain specialized applications windows can be glazed with a clear fireproof ceramic). 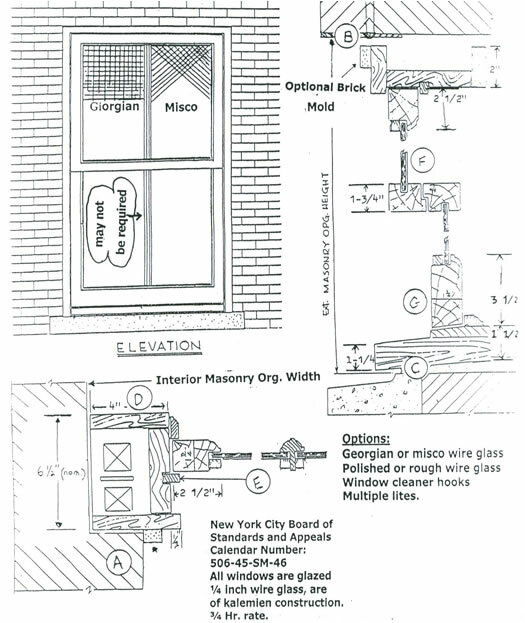 A fireproof lot-line window should be intalled into a masonry opening in such a way that there is no combustible material between the window and the existing wall. Please contact us for complete measuring and instalation information. Because of the classic design of our lot-line window, including true divided lite glazing, our lot-line windows have frequently been used for landmark and other historic jobs. We can install our windows at job sites in the New York City Metropolitan area or our windows can be shipped to your job site to be installed by your contractor. They are shipped completely glazed and with all sash weights and sash installation hardware.